In modern geophysics, hydrostatic dependence of pressure on the depth in the lithosphere is postulated. It is considered evident and requiring no proof. As shown in the present work, the above postulate is erroneous. Proceeding from one of the fundamental laws of physics related to the minimum of potential energy in the equilibrium state, one can derive a nonhydrostatic solution of the elasticity equation with minimum elastic energy referred to as a Gravitational Equilibrium Field with an energy by an order of magnitude less than the hydrostatic field energy. The Earth’s solid shell like a bearing structure carries its own weight, which reduces the pressure on the surface of the liquid nucleus down to zero. The influence of solidity in the subsurface region of the Earth is characteristic. As the calculation shows, although the rock density in the crust is thrice as much as that of the water, the pressure in the ocean at the same depth is higher than the pressure in the solid crust, which is an account for the existence of land. If there was a hydrostatic stress distribution, the pressure under the continents would be thrice as much as that in the ocean and the continents would descend below sea level. At the present-day level of geophysics, the problem on the stress field in the lithosphere has been poorly investigated in terms of theory. It is postulated that the stress field in the lithosphere is hydrostatic in nature and coincides with the pressure field in the liquid of the same density  . It means that the stress tensor for the lithosphere has stress components other than zero on the main diagonal and they are equal. The hydrostatic stress distribution in the lithosphere is considered “evident” and requires no explanation or proof. The models of the Earth’s structure, which have been suggested, are based on the above postulate. The lithosphere stress field is fundamental in geophysics. It determines the parameters of the plastic flow, the tectonic plate movement, the formation of earthquake and volcano chamber. The knowledge of these stresses is essential in designing engineering underground structures, as well as for geological exploration and other purposes. 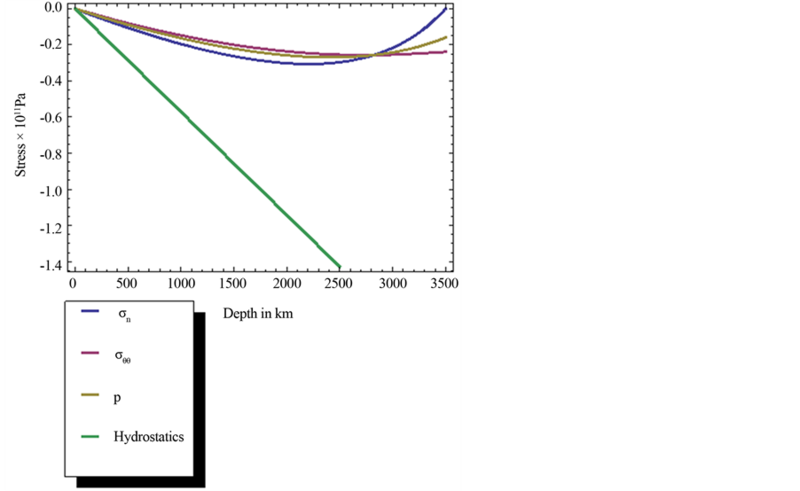 In this work, the main principle determining the formation of the lithosphere stress field is one of the fundamental laws in physics and, namely, a system is in equilibrium at minimum of its potential energy. If its potential energy exceeds its minimum, then there appear some forces that tend to bring a system to equilibrium. During the geological period of time, the processes occurring in the lithosphere must bring it to the equilibrium state with minimum elastic energy, which considerably differs from the hydrostatic field. Here C is an arbitrary constant. According to the theory, it is necessary to add a general solution of the homogeneous equation to (2.7). Here K is the modulus of cubic compressibility, and are the Lamé coefficients. The first component in (2.14) is the elastic energy density caused only by the change of the volume, while the second component is the elastic energy density caused only by the shear. If a gravitating sphere has a solid shell with a liquid nucleus inside, then when determining the stress field of the lithosphere, unlike a liquid sphere, we should consider that . The deformation field in the solid shell is given by (2.10) and, according to (2.12), the arbitrary constants and the lithosphere stresses including those on its internal boundary are determined at . The above solution is not implemented in nature. However, it is needed as a starting point for finding a realizable solution. It is worth noting some specific features of the solution (2.9). There are no stresses in the absence of gravitation. Application of gravitation results in an elastic field (2.10). If gravitation is removed, then the elastic field disappears, that is, there is no plastic flow at loading, which disagrees with materials science data. At any value of loading the processes of plasticity and mass transfer take place in a solid. The assumption of the absence of plastic deformation holds true only for short time intervals. Taking into account the long time of the lithosphere existence, mass transfer caused by diffusion, a magma flow, etc., makes a large contribution to the stress field. As a result, the elastic field changes so that its elastic energy decreases. During the geological period, the lithosphere elastic field energy reaches its minimum irrespective of the initial stress distribution. The elastic filed with minimum energy is the GEF. The formulae (2.15), (2.22), and (2.33) yield a solution of the problem of stresses in the lithosphere possessing minimum elastic energy at an arbitrary value . Undoubtedly, one could substitute (2.22) and (2.33) into the expression for stress (2.15) and write it in the explicit form, but then the equations become too long and, therefore, inconvenient. Let us substitute the values of the Earth parameters  into the above formulae: , , , , , , . Here the pressure has a negative value due to the fact that in the elasticity theory the deformation of compression is a negative value while tension is a positive one. As density we take a value resulting from averaging the data on the lithosphere density from  . Figure 1 shows the plots of the stresses and , the pressure derived from (2.24) as well as the plot of the hydrostatic pressure taken from  . In the plots the sign of tilde is absent. If the value of pressure at the nucleus boundary is taken to be equal to , then the energy value (2.27) is , and for the hydrostatic stress it is . The energy of the nonhydrostatic field stresses is by an order of magnitude less. Since the pressure P at the lithosphere internal boundary is unknown, here you can see calculation for several values of P. The pressure P can also be determined from the condition of minimum energy. Calculation of the minimum energy by P shows that minimum energy will be on the lithosphere internal boundary at a positive value, that is, in tension. However, a liquid nucleus cannot undergo tensile stresses, at least its surface pressure can be zero. 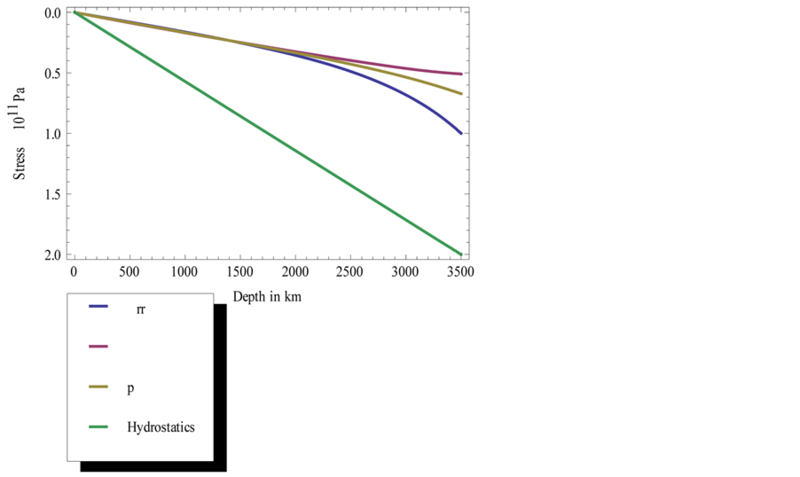 Figure 2 shows a plot of the stress field under internal boundary pressure of the lithosphere at in (2.23). As one can see in the plot, the radial stress is considerably less than for the case in Figure 1, and the elastic energy for this case is which is less than for the variant in Figure 1. For example, in Figure 3 there are plots of stresses for . The elastic energy corresponding for this case is . Comparing the plots in Figure 2 and Figure 3 one can see that the stresses nearly at the whole depth of the lithosphere weakly depend on the value of P, whereas in the subsurface layer, which is several hundred kilometers thick, they coincide. Figure 1. The stresses and their pressure are plotted when the value of pressure at the nucleus boundary is taken to be equal to 1011 Pa. Figure 2. The stresses and their pressure are plotted when the value of pressure at the nucleus boundary is taken to be equal to 0 Pa.
long enough, then the elastic deformation will completely disappear and the spring energy will become zero. The same process occurs in the lithosphere. At first the stress distribution can be arbitrary. But if the energy is not minimum, then in the lithosphere, just like in a loaded spring, the processes of plastic relaxation will start which decrease its elastic energy and in the long run, will reduce it to minimum—the GEF. Thus, the lithosphere proves to be a bearing system, which, similar to building structures, bears its load, its weight, without transferring it to the nucleus and can even ensure that the pressure on the nucleus surface is equal to zero. Figure 3. The stresses and their pressure are plotted when the value of pressure at the nucleus boundary is taken to be equal to 5 × 1011 Pa.
Table 1. The pressure on land and under ocean bottom. pressure on a free surface. The third column shows the pressure in the ocean at a depth of 5 km and the pressure in the crust under the ocean depth. In this case, the water pressure at the ocean bottom will be . In the fourth column, it is the same only in the ocean at a depth of 10 km, where the pressure at the ocean bottom will be . Cells related to the ocean are highlighted in blue. Here one can clearly see the role of the solid character of the lithosphere. In spite of the fact that the density of solid rocks is three times higher than that of the water, at a depth of 5 km the pressure in the ocean is by 13% higher than that in the crust. At a depth of 10 km the discrepancy is even larger. This example shows the principal difference of the stressed state of the lithosphere from hydrostatics. The existence of land is caused by this effect. If the lithosphere had a hydrostatic pressure distribution, then the pressure would be greater under the continents, since their density is three times as much as that of water, and in the course of time, they would sink below sea level. 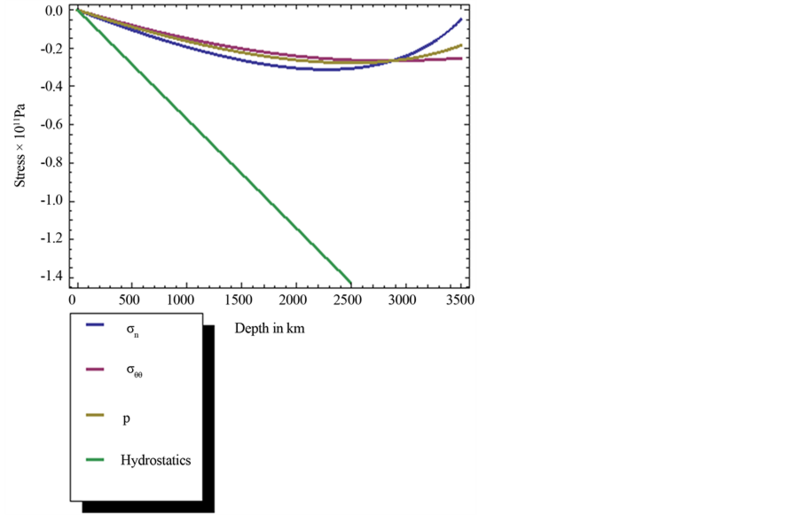 At a hydrostatic stress distribution, the uniform distribution of water on the planet surface is more favorable in terms of energy. The ability of the lithosphere to bear a load, i.e., its weight basically changes the situation. It can be of interest to carry out energy research into the relation of land and ocean areas. It seems likely that this relation is also determined by minimum elastic energy. But this is a question of a separate investigation. In modern geophysics when considering stresses in the lithosphere, they postulate them as hydrostatic; there are no shear stresses. The distribution of pressure in a liquid with the same density as in the lithosphere is taken as the equilibrium state  , which is considered unquestionable and is not even discussed. The solid properties in the lithosphere do not matter in this hypothesis. On the whole, when dealing with physical problems one must proceed from general physical laws. One of them is the principle of minimum energy in equilibrium. Hydrostatic stress distribution does not ensure the minimum. Minimum elastic energy occurs at the GEF. Even near the Earth surface, the pressure in the crust is greatly different from the hydrostatic pressure in the ocean. It is related to the fact that hydrostatic distribution has no shear stresses, and energy is the quadratic stress function. If shear stresses are introduced, one can reduce normal stresses and decrease energy. In this work the coordinate system is chosen in the main axes, in which only stress tensor components along the main diagonal are different from zero, but, unlike the hydrostatic case, they are not equal. 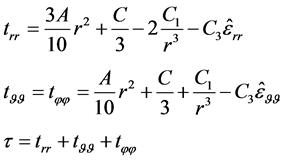 In the nonhydrostatic case, in the coordinate system rotated relative to the main axes, there are nondiagonal components different from zero, whereas in the hydrostatic case, in any coordinate system nondiagonal components, there are components of zero and diagonal ones are equal. The nonhydrostatic character of the pressure in the crust can be used for engineering purposes. For example, one can artificially decrease the nonhydrostatic character of the stresses in a local site of the crust, in particular, above an oil field, which will raise the pressure in an oil stratum and, as a result, increase its oil recovery. Other applications are also possible. Landau, L.D. and Lifshits, E.M. (1986) Theory of Elasticity. 3rd Edition, Elsevier Butterworth-Heimenann, Oxford. Elsgolz, L.Y. (1969) Differential Equations and Calculus of Variations. Nauka, Moscow. Zaitsev, V.F. 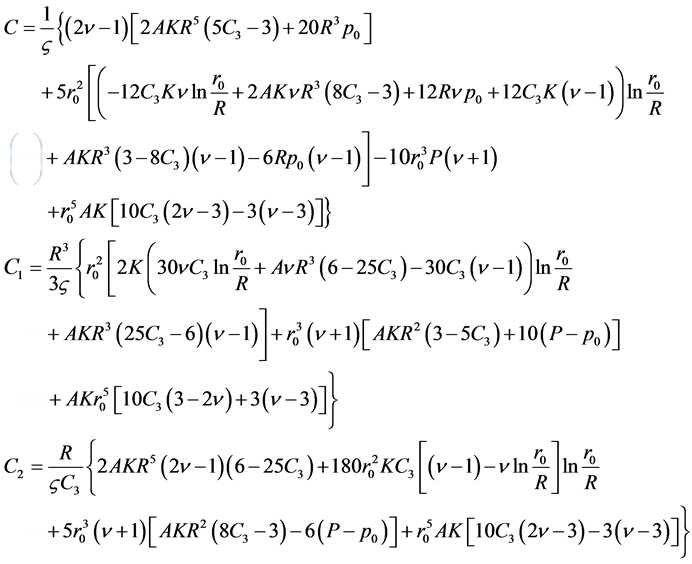 and Polyanin, A.D. (2003) Handbook of Exact Solutions for Ordinary Differential Equations. Chapman & Hall/CRC, Boca Raton. Vikulin, A. (2009) Physics of the Earth and Geodynamics. V. Bering State University, Petropavlovsk-Kamchatskii.